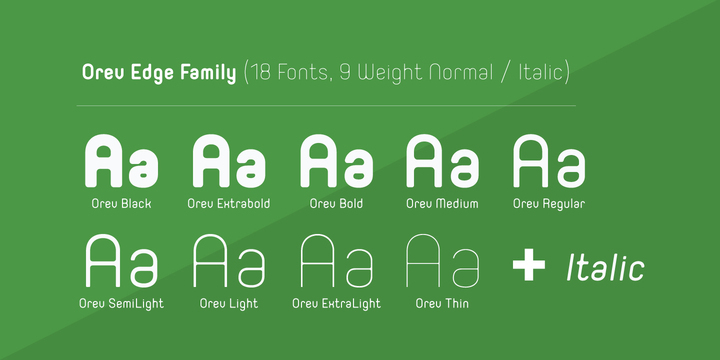 Orev Edge is a modern curved geometric font family created by Chatnarong Jingsuphatada and published by Typesketchbook. Using smoother terminals, curved inner lines and warm harmonized styles, Over Edge is a modern alteration of the original Orev typeface by delivering an eye catching and original typeface great for cooperative work, such as website, magazine, editorial, publishing and packaging. Achieve typographic excellence with Orev Edge! A font description published on Friday, September 9th, 2016 in Chatnarong Jingsuphatada, Fonts, Typesketchbook by Andrei that has 2,638 views.